(U) Title III of the Foreign Intelligence Surveillance Act Amendments Act of 2008 required the Inspectors General (IGs) of the elements of the Intelligence Community that participated in the President’s Surveillance Program (PSP) to conduct a comprehensive review of the program. The IGs of the Department of Justice, the Department of Defense, the Central Intelligence Agency, the National Security Agency, and the Office of the Director of National Intelligence participated in the review required under the Act. The Act required the IGs to submit a comprehensive report on the review to the Senate Select Committee on Intelligence, the Senate Committee on the Judiciary, the House Permanent Select Committee on Intelligence, and the House Committee on the Judiciary. (U) In response to Title III requirements, we have prepared this unclassified report on the PSP, which summarizes the collective results of our reviews. Because many aspects of the PSP remain classified, and in order to provide the Congressional committees the complete results of our reviews, we also prepared, and have bound separately, a classified report on the PSP. The individual reports detailing the results of each IG’s review are annexes to the classified report. 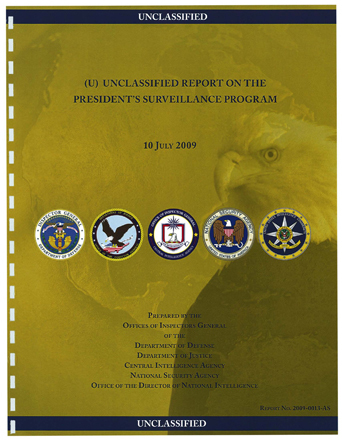 (U) The applicable legal standards for the collection, retention, or dissemination of information concerning u.s. persons reflect a careful balancing between the needs of the government for such intelligence and the protection of the rights of U.S. persons, consistent with the reasonableness standard of the Fourth Amendment, as determined by factual circumstances. As explained below, the PSP expanded the NSA’s authority by allowing it to conduct electronic surveillance within the United States without an order from the FISC when certain factual conditions and legal standards were met. According to the NSA OIG report, the first Presidential Authorization was the product of discussions between former NSA Director Hayden and White House officials. Hayden also consulted with NSA senior technical experts and experienced attorneys from the NSA’s Office of General Counsel. While he consulted with NSA personnel in identifying critical intelligence gaps, only Hayden knew about and participated in the development of the Presidential Authorization by serving as a technical advisor. After the Authorization was signed, NSA attorneys supported the lawfulness of the resulting program. Hayden stated that DOJ did not participate in his early meetings about the NSA’s collection activities. As noted, the Attorney General was read into the program on the same day he signed the first Authorization as to form and legality. When the NSA received the first Presidential Authorization, Hayden noted that he was assured by the signature of the Attorney General that the program was iawful and had been reviewed by the White House and DOJ. After Hayden received the first Authorization, he assembled 80 to 90 people in a conference room and explained what the President had authorized. Hayden said: “We’re going to do exactly what he said and not one photon or electron more.” The NSA’s purpose in implementing the PSP was to collect foreign intelligence. According to Hayden, the activities were targeted and focused with the purpose of “hot pursuit” of communications entering or leaving the United States involving individuals believed to be associated with al-Qa’ida, not to intercept conversations between people in the United States. The intercepted communications had to be reasonably believed to be al-Qa’ida communications, one end of which was in the United States. According to the NSA OIG, the PSP had standards for targeting al-Qa’ida. There were several layers of review, starting with an NSA management review, and the NSA OIG conducted a review of target folders to ensure compliance with program standards and additional management controls. A sample of target folders was tested to determine whether targeting decisions were adequately supported. Any ambiguities were discussed with analysts and adequately resolved. The NSA OIG reported that the NSA’s conduct of the PSP was reviewed and monitored by the NSA Office of General Counsel and the NSA OIG. According to the NSA OIG, NSA employees involved in the program received tailored training and their work was overseen to ensure that all activities were consistent with the letter and intent of the Authorization and with the protection of civil liberties. The NSA OIG report concluded that it found no evidence of intentional misuse of the PSP. Hayden stated that although he understood that the PSP activities were more aggressive than those available traditionally under FISA, he believed that the PSP was less intrusive because the period of time in which collection was conducted was, in most cases, far less than was authorized in a typical FISC order. Additionally, the sole purpose of the overall PSP was to detect and prevent terrorism against the United States. According to Hayden, the program was designed to provide the NSA with the operational agility to cover terrorism-related targets. October 6,2003. Even though Bybee had never been read into the PSP, Philbin persuaded Counsel to the Vice President David Addington to read in Goldsmith, Bybee’s replacement.